Marco Werba was born in Spain, studied various aspects of classical music in Italy, France and the US, and is now based in Rome. As a composer he has written a number of classical concert pieces, including for example his "Adagio for the victims of Auschwitz", "Dark Symphony" and "Symphonic Tango". Werba has always had a strong interest in the medium of film and increasingly he has found opportunities to create film scores, frequently in the Historical Drama and Horror genres. Werba worked as musical assistant to Jerry Goldsmith while he was recording the film score for "Leviathan" in the late 1980s with the "Santa Cecilia Orchestra" in Rome. Around the same time Werba composed his first film score "Zoo", directed by Cristina Comencini and starring Adia Argento, daughter of the director Dario Argento. The music for Zoo won the prestigious Colonna Sonora (or Soundtrack) Award in 1989, when Ennio Morricone and Francis Lai received Lifetime Achievement Awards. 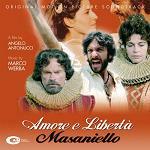 Since then the composer has scored a range of historical dramas such as "Il Conte di Melissa", "Amore e libertà - Masaniello" and "Anita - Una Vita per Garibaldi". In more recent years however, Marco Werba has been involved in several films in the Horror and related genres. He has worked twice with director Timo Rose on "Fearmakers" and "Beast". Interestingly Timo Rose had an acting part in "Darkness Surrounds Roberta" which Werba scored for director Giovanni Pianigiani. "Colour from the Dark" is another horror drama directed, this time directed by Ivan Zuccon and based on a short story written by H. P. Lovecraft in 1927 called "The Colour Out of Space". 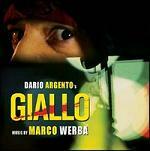 Werba's biggest role to date was scoring the film Giallo for cult horror director Dario Agento. "Giallo" in Italian means "Yellow" though it also refers to a pulp genre encompassing elements of thriller, mystery and crime drama. Giallo was set in Turin and first shown at the Edinburgh International Film Festival in 2009, though its theatrical release was delayed until 2011 due in part to a legal dispute with actor Adrien Brody. Marco Werba has also been involved as an organiser and judge for the Mario Nascimbene Award which is named after the great Italian film composer and awarded to promising film composers in a competition. The composer has also been on the receiving side for several awards, most recently winning the 2011 Globo D'Oro (Italian Golden Globe) for his music score to "Native". Most recently Werba has scored several Italian films including "I Fiori Del Male", "Ballando il Silenzio" and "Fratelli di Sangue" but has a number of projects lined up over the next year. The composer's official web-site is at www.marcowerba.com. 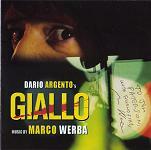 Giallo (Yellow) - directed by Dario Argento, with a varied orchestral palette winning the composer a "Fantasy & Horror Award"
Soundtrack CDs by Marco Werba are relatively rare, but it is worth checking the following links for availability. The first item listed is "The Horror Film World of Marco Werba" which includes the soundtrack to "Darkness Surrounds Roberta" plus additional tracks from "Fearmakers" and "The Ocean" (with orchestral effects). Marco Werba uses social media websites to promote his music, and a number of film trailers or tracks can be found on youtube. Here are links to some examples either containing the composer's music or related to his film scores. Director Ivan Zuccon - includes many photos and other information in his Production Diary for "Colour from the Dark"
Here is a CD cover signed by Marco Werba. Click the thumbnail below to see the image full size in a separate window.